The lines in front of Yogurtland's Bancroft Way shop attest to the chain's popularity. Some local yogurt vendors have seen a decline in business since this location opened. The key to the current economic recession may be cold, sweet and eaten with a spoon: frozen yogurt. Within a half-mile radius of the UC Berkeley campus alone there are more than seven yogurt stores, but Anaheim, Calif.-based vendor Yogurtland seems poised to take a leading stake in the neighborhood's yogurt market. After opening a location across from campus on Bancroft Way this spring, the chain is set to open a new location on Shattuck Avenue. 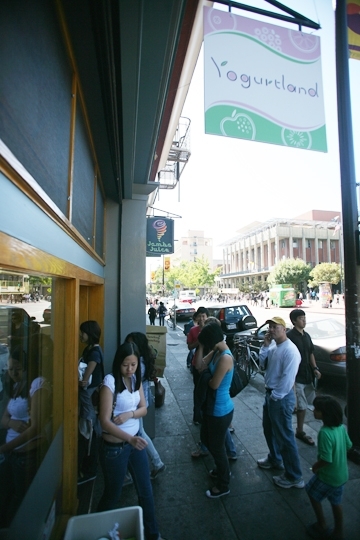 Huong Vu, the general manager of the Yogurtland location near campus, attributed the shop's success to its enjoyable environment and self-serve model. "There are endless possibilities," he said. "Besides, it's just fun-it's the culture, the atmosphere, the music." But as Yogurtland continues to grow, other local yogurt vendors said they have experienced a decline in business. Sean Kang, the owner of Papamingo, said he hopes his recent switch to a self-serve business model-and a 10 cent per ounce price reduction-will increase business. "I look forward to better business after turning to self-serve," he said. "It's very hard to operate a business with this kind of price, but I'm trying it right now." Charles Lee, the owner of Michelle's Yogurt and Sweets, said Yogurtland is to blame for decreased business at other yogurt shops around the area. "I believe Yogurtland took a big chunk of Yogurt Park's business, my business and Papamingo's business," he said. However, Lee said he hopes to retain some business because his product can be cheaper than it is at Yogurtland. Yogurtland, so if customers are after more toppings than yogurt, Yogurtland is a better deal. But if it's pure yogurt they seek, Michelle's comes out cheaper. Due to the competition, Jon Pittman, a lecturer at the Haas School of Business, said some yogurt shops may soon start to close. He said cheap prices are not a sustainable solution to surviving the yogurt showdown, but instead shops must offer products that are not easily copied. "To make it sustainable they have to make it something that people want that's hard to replicate," he said. "In yogurt that's a tall order because it's pretty easy to copy." Even though several local yogurt shops say their business is hurting because of Yogurtland, the owner of one yogurt shop said his business is still going strong. According to Marty Piscovich, owner and founder of Yogurt Park, the shop is not considering becoming more like Yogurtland. "People think we're the sweet and the others have the tart and there's a market for both," he said. Piscovich said he has watched yogurt shops come and go during Yogurt Park's 32 years of business, and wonders if the present market can sustain all the current shops. "It's pretty crazy, I'm one of six in a block and a half," he said. "Over 32 years I've seen several that have come and gone in the area and I just can't believe the market is that large for all six to survive." According to Piscovich, changing Yogurt Park's business model would upset loyal customers. "We're the old-fashioned store that's been there forever and after all these years it wouldn't be a smart business move to make a change," he said. Alex Pinigis, who has worked at Yogurt Park for a year and a half, agreed that Yogurt Park has its place among popular yogurt startups. "Even in the yogurt market there's kind of niches," he said. Meanwhile, with Yogurtland's new location set to open, Mark McLeod, president of the Downtown Berkeley Association, said yogurt and ice cream chains are partially responsible for filling empty storefronts downtown. "Yogurt for whatever reason seems to have the ability to survive and flourish in this economic environment," he said. "It appeals to people who want to have something light and playful and refreshing." Zach A. Williams and Erika Oblea of The Daily Californian contributed to this report.